One of my favorite ways to take notes is with Foldable Notes. This is an easy way to get students to create their own notes and develop the Math concepts in their own writing. 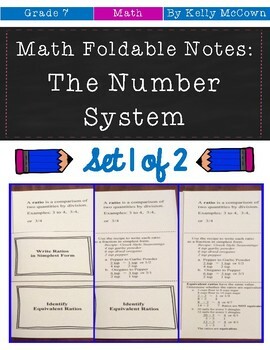 I have two NO PREP Foldable Note sets for 7th grade The Number System. These are easy to print and go! You can use a scaffolded approach or just print for absent students. It's a great alternative to traditional note taking!! These math foldable notes are for students to be able to apply and extend understandings of addition, subtraction, multiplication, and division of integers, absolute value of their difference, and apply properties of operations as strategies. These math foldable notes are for students to be able to apply and extend understandings of addition, subtraction, multiplication, and division of fractions, simplifying fractions, comparing fractions, solving equations with fractions, and apply properties of operations as strategies. March $20 TPT Gift Card Giveaway!